Did you ever feel like you were running around in circles? I ask because, well, I'm hoping I'm not the only one. At a recent dinner party, I was seated next to a late 40-something mother of three-- A newly divorced and happily dating woman overflowing with energy and a sense of wonder, who asked me a simple question-- What's your passion? My blank stare caused her to continue firing more probing questions faster than I could say "Margarita on the rocks, please!". (And, I don't even drink.) Her high octane wonder was all about "reinventing" herself and she wanted a little "how to" advice from me. "What excites you-- makes you jump out of bed every morning ready to meet the world? What are you just itching to do? Are you traveling, where's your next adventure, what's new and exciting that's coming up for you???" Her questions instantly depressed me because I couldn't think of One. Single. Thing. that would even remotely sound "exciting or passionate" to this woman who was only 6 years younger than me. Had I lost my fire? Was I really as boring and underachieving as I felt at that moment? It reminded me how little I've managed to accomplished lately despite feeling like I've been in overdrive for months-- chasing important paperwork, coordinating appointments, arranging get togethers, looking for all the stuff I can't seem to locate when I need it... You get the picture.... running in never ending circles with no sense of accomplishment and definitely not an ounce of passion. A sense of accomplishment is one of the things I miss most since I stopped working nearly four years ago. Even saying it's been FOUR years puts a lump in my throat... What the heck have I been doing all this time and when was the last time I felt that joyous rush my dinner partner was gushing about? Let me back up by saying I stopped working for what I thought at the time were very good reasons-- not the least of which was that I had accomplished enough to have earned the right to "retire". And, at the time, I thought I had prepared myself for retirement with countless interesting and meaningful things that I looked forward to doing with my new found spare time. Leisure time worked really well for me-- for about a week and a half. Seriously, how much sleeping in and lunching with friends can a Type A personality girl do? In short, I have not learned to fully embrace life in the slow lane-- A new life without fast-paced deadlines, business meetings that made my blood boil, globe trotting to film festivals, or creative sessions that made me sit straight up in my chair with joy. Yes, I now do meaningful work with two important charities-- arts education and lupus-- and yes, I spend far more quality time with family and close friends, but it's that sense of accomplishment-- the excitement of a successful project you can see or touch, that's left me feeling like I'm a bit lost and running in circles. So after that dinner party I took a long hard look at "retirement" (gawd I hate that word) and grabbed the bull by the horns, so to speak. 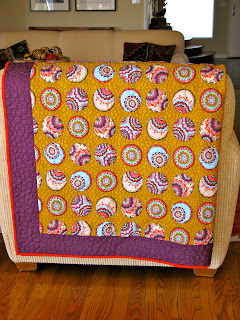 My first step was to embrace and enjoy running in circles... By way of my sewing machine. I've spent hours going round and round and round and the sense of accomplishment with every turn has been refreshing and even exciting as I watched the project come together. No, this might not sound glamorous or exciting to some, and definitely not to my dinner companion, but I'm coming to understand that "following your passion" can also be finely disguised as being content with your life. I am looking for new dreams that I would like to turn into a new goal. This is an area you should look into perhaps? Oh, JJ, you are singing my song again! 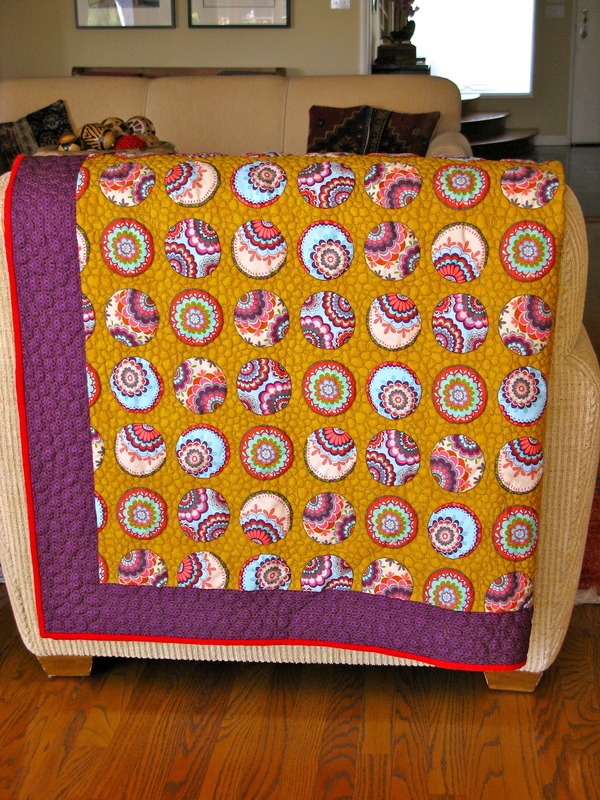 First, let me add my praises for the gorgeous quilt! And I love how you got that "contentment" is the perfect reward for following your passion or your bliss. I get exactly what you meant in the first part of your post, too. I've had to slow down my writing career to care for my mom and deal with her dementia ... just when I thought I would start to enjoy the freedom of the empty nest and have more time for my creative work. It's very hard to step back and feel like I'm not accomplishing something "important" with my work, even though caring for my mom is very important ... I think I need to redefine "achievement"! I just read a quote that said something along these lines: "In our culture, we're good at getting what we want, but we don't know how to enjoy it once we do." Isn't that the truth? beautiful sewing,I've never learned to do that more's the pity. I like your last sentence about contentment versus passion. Maybe it all depends on what stage in your life you're at. my passion, of course, is my poetry. "Dance!" What, you don't dance on command? Join the club! Your last lines said it for me too. at last! I've had plenty of drama, now I'm floating submerged in life's honey. I am very impressed with your words!! Contentment is the key word! I too have experienced these same feelings, but they were very short lived, because I realize that what I do matters to others and that I really am content. And, may I say that I am very impressed with your quilt! Gorgeous! hang in there...Enjoy life to the fullest, by loving what you do. Your quilt is beautiful. I totally understand how you are feeling. When I quit working I wondered how or what I would define myself by, since my job had been it for so long. Then I realized my passion was just enjoying every day, every sunrise if I was up, every sunset, time with my husband that wasn't rushed, living life on my terms and doing what I wanted or needed to do. And right now my passion isn't very exciting, it seems getting the house and laundry and grocery shopping done so that when I get chemo on Friday I can rest for the whole weekend and recover from feeling like crap with no guilt or dirty bathrooms. Wow, that sounds just sad, huh. Hugs!! LOVE everything about that quilt! Not so much your dinner companion. I do love that quilt, and absolutely - your passion is what you define it as. I do like meeting people like your dinner companion and, you know, YOU, who remind us to ask ourselves that question occasionally. Always good to take stock on these things and make sure we're where we want to be! Great post...Lovely blog! I'm a new follower! Ah, wait until you have the Sixty FActor. It's no different. I've never really had a strong passion for anything (except my husband of 34 years), although I do rememember blogging madly 3 times a day when I started six years ago. There was so much to say. Now I'm just 'content', busy with a new career "Granny". Grammatically that comment above was the worst in history. =( Doesn't matter. I'm wondering when are you going to start selling those amazing quilts because I really want this one! As for passion...for me it is creating a new piece of art...I love it. Causes me to jump up every morning with new ideas to try on the piece I am working on. I love it!! Good on you discovering your passion. It's all about following our dreams - no matter how small or big they are. Wonderful post! I'm sort of coming to that part of my life, too! Moving and empty-nesting at the same time. Life will be different, but I look at it as a new adventure with lots of time to explore! The quilt is beautiful! I'm so torn between selling my old sewing machine or hanging on to it so I can create works of art like you have! geez woman! that quilt is gorgeous! Passion, like fire, can look different. Cozy hearth. Bonfire. Conflagration. Embers. I think everyone' can look different, too. Do I detect a bit of an apologetic tone in your post? Well, knock it off! That newly-divorced woman is going through a temporary phase, not a new life-style. She will come down from the "high" and begin to evaluate her position in life and question her choices just like the rest of us. Don't try to validate your life by her current state of passion! A good friend of mine just started taking art lessons for the same reason. She found her passion in drawing/painting, but I am still in the process of finding mine. I hope we get to see some of your new creations on the sewing machine! Seems I had grand illusions of 'retirement'. Ya know, readin' a book on the deck while watchin' the birds frollic and the flowers grow. Boy was that a pipe dream!!! It's a runnin' joke 'round the Ponderosa 'bout my 'free' time. I'm an all or nothin' kinda gal and seems I shoulda known I'm too dang spastic to sit anywere! Heeehehehe! Girl, we see your passion all the time though your words,your zest for life, the love of family, your wonderful sense of humor and in that beautiful quilt baby!!! I can't sit still long enough to sew a square but oh my goodness glory, circles. Wow, ya have to have passion to complete that project! There is a quilting group in town that meets every Thursday and I am in awe of them. They don't meet at the senior center, most of them are not seniors. It makes me wonder if I will have time some day to learn to quilt. Your work is beautiful. Absolutely lovely. You have a great talent. Actually you have many. Hugs. lately more and more people are asking that question...what's your passion. what excites you ? and at first, it scared the crap out of me, but now that i truly have a passion, i find myself asking others the same thing. It's funny that your last line was about the important of being content with your life. That was what I was screaming in my head the whole time I was reading your post. Things don't have to be GRAND for us to be happy. And who could ask for more than that? I couldn't answer one of those questions either!......! I hear you on the retirement issues -- I have the same ones after retiring two years ago. And that woman? She's on a temporary high of freedom and it too shall pass. Her life will once again become as sedate as everyone else. What gets me up out of bed in the morning is the thought of a leisurely morning walk followed by a cup of really good coffee. My sense of accomplishment comes from being an excellent domestic goddess and helpmate to my parents. I'm the 'go to' gal in my family when all the worker bees are running around like chickens with their heads cut off (mixed metaphor). It's a whole different existence, and just as valuable (if not more so) than working for someone else. Now, if I could only quilt like you do, THAT would be a great sense of accomplishment. It's a lovely piece of art, my friend. If you find that you a lot of time in your retirement then you aren't really retired. I now wonder how I managed to work, when my days are full of stuff that needs doing urgently. Gardening, walking, doing charity work, reading, writing, cuddling the dog, thinking, entertaining and being entertained. Everybody's dreams are different, I do what I want to do when I want to do it. It's bliss. JJ! The first thing that struck me about that post as I began reading it was that you said there wasn'ta single thing you could think of that would sound interesting or passionate to THIS WOMAN! 'What about your work for lupus and arts education?'. Yes my brain screamed it before you wrote it. 'What about your love of family?'. Yes, that, too, came to mind before you wrote it. To your readers, your passions are clearly defined and obvious. And now you've created this beautiful quilt! You inspire countless folks by example, JJ! I am sitting here crying. Yep, you made me cry. Are you happy now?! First, I had no idea you are that talented in the sewing regard. The writing, well, yes we all know that, but who knew about the sewing thing?! Next, just last night I was running negative tapes in my head...having just come back from Michael's business trip where I am simply, "Michael's wife," while he's a million dollar producer for this fortunate company. And, I realize that although those people think I'm fun, charming, and witty, they don't have a clue who I USED to be when I was a professional person. Hell, I don't even much remember who I used to be. So I can so relate to this post. So, friggin' relate. I'm running in cirlces chasing my own fat tail. It's in my mind mostly, but some days it's in the reality. I'm feeling lost and I'm feeling less-than and fretful. I can't shake the feeling that I'm supposed to be doing something important but I don't know what it is and IT hasn't presented itself to me. I'll be 57 in a few months and I look at myself and wonder How the HELL did you get so old and what do you have to show for it. Joanna, Of all of the blogs on my "roll", yours is the only one I took the time to comment on today. That is because I believe we have a lot in common. When I feel "dumbfounded" as to how to answer a question, flustered, it's usually because my audience wouldn't really understand my answer. Not due to anything lacking in me. So, I am sure this woman would never understand or appreciate what your passions are. I think your efforts are pretty darned rewarding. Keep going around in those kinds of circles. JJ - I think the hundreds of people who read your wonderful blog have provided you with the answer! I think we all have different concepts of what "grabbing the bull" is all about. I think, from the years I've been reading you, that you have successfully entered into the world of retirement. Possibly you just don't feel as fullfilled as you had hoped you would and I guess to some the other persons' grass always looks greener, but I admire what you do/have done/continue to do...even the sewing! I don't sew, I staple and tape!! Your last paragraph says it correctly. Sometimes, being content is what makes us... well, content! And what we find fun and worthwhile may not seem very exciting to us, but it may actually be just the thing for the other person who is asking you about it. And if it isn't? So what? The person is asking what makes YOU get out of bed, not what you think might get them out of bed. I get excited about fast-pitch softball and playing the bass, among other things. Do those things float YOUR boat? I don't know for sure, but I expect not. I know it's a fairly useless thing to say to a Type A, but relax. Enjoy where you are instead of worrying about where you're going to be. And really, truly, understand that what you see as possibly unexciting and unfulfilling is probably envied by quite a few! This quilt is so incredibly gorgeous! I LOVE it - especially that first image. The quilt is awesome! I'm not sure I could answer any of those questions myself! Your writing touches a lot of people. Well first hon I will say..WOWZA that quilt is stunning...make more please..and anything else your heart desires..Let Fly girl!! Oh as I was reading I was thinking there is no way in hell I could have answered that woman either. I am very much the same. I am busy but not necessarily making great strides. Life is peaceful though and I like it. I agree contentment is where it's at. And your quilting is magnificent. Very clever. Flowers and a NEW GIVEAWAY!